A few weeks ago my friends, Double Down, Dirty (yes, we call him Dirty), and I went to the last session of the Drink Craft Beer Spring Beer Fest. The theme this time around was hoppy beers like IPA’s. Upon entering the Beer Fest, which was at Space 57 at the Revere Hotel in Boston, I grabbed a pamphlet that had the layout of the booths and all of the beers on tap. Armed with a plastic 2 oz. sampler cup, I embarked on a beer tasting adventure that resulted in at least 30 different beers gracing my taste buds (sometimes more than once!). The beers I tried are outlined in blue in the picture below. The best beer in my opinion is highlighted in yellow and the worst beer is highlighted in black. The beer fest was not only extremely fun, but it introduced me to many many beers I’d never had before. Below are my top 4, bottom 4, and middle level picks of the beers I tried. We also had some tasty food along the way as well. I would definitely recommend a visit to one of the Drink Craft Beer sponsored events, which seem to happen seasonally. 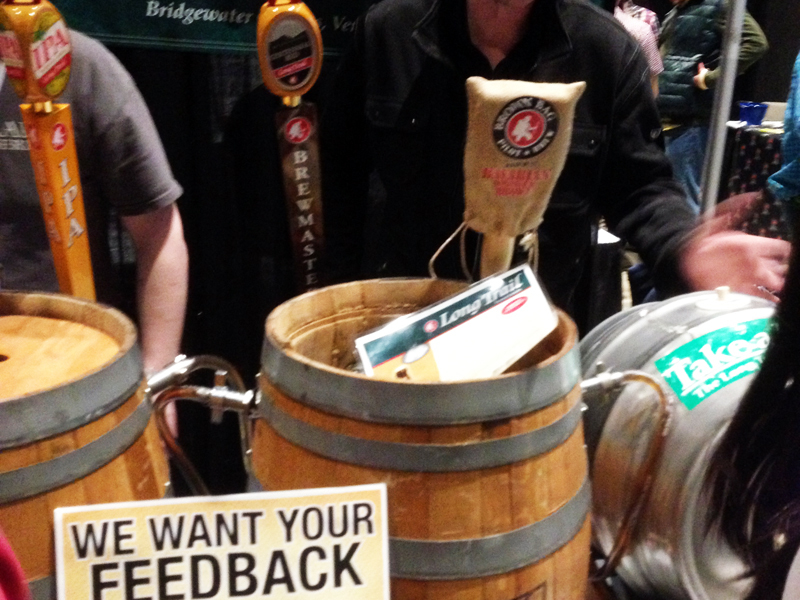 Longtrail – Brown Bag Pilot Brew. One of the more interesting beers I tried tasted like drinking a liquid campfire. I can’t say that I could drink an entire glass of this beer, but I have to applaud the skill. The taste actually made me feel like I was sitting around a campfire cooking with my friends as smoke lazily wafted into our faces. Again, a little goes a long way, so a small amount along with a BBQ sandwich is probably just perfect. 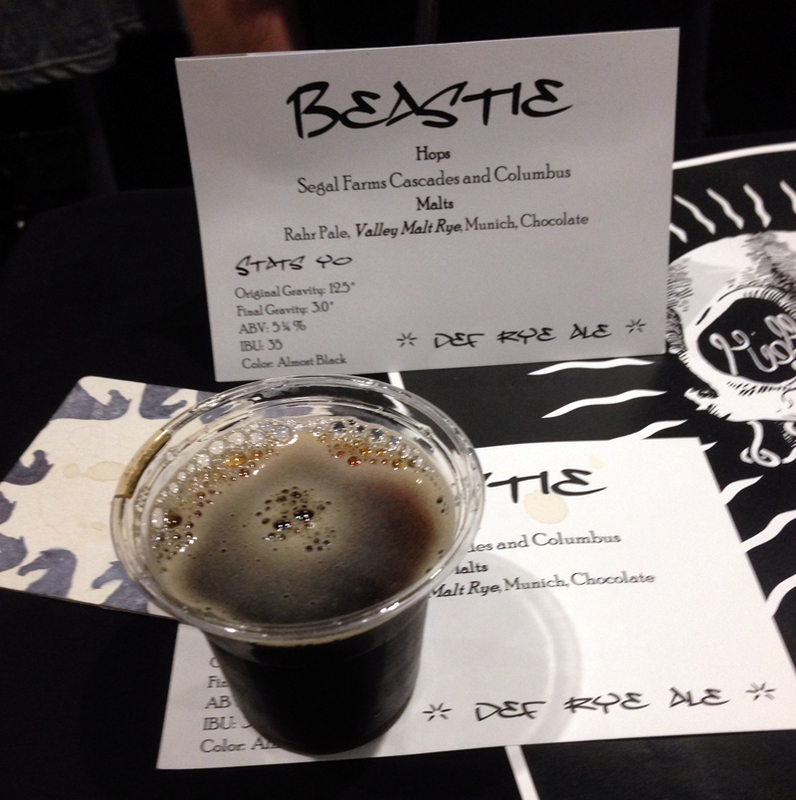 High Horse Brewing – Beastie. Another pretty good beer was Beastie, which was heavy, dark, and actually tasted like the hints of chocolate in the description. In case you didn’t know, I have a lot of respect for beers that successfully accomplish what they say they taste like or adequately reflect the ingredients used. 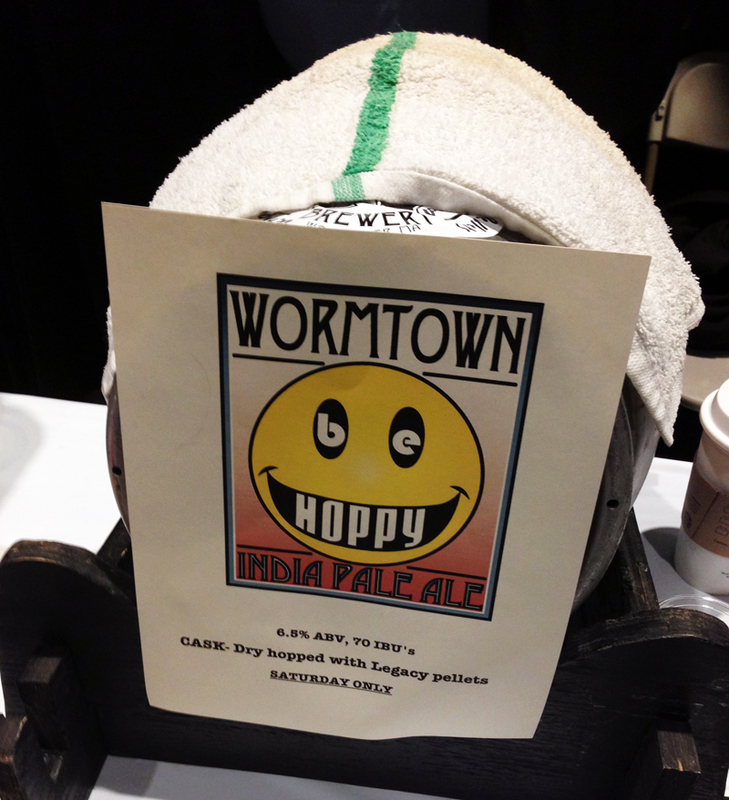 Wormtown – Be Hoppy. I was as surprised as anyone to see something good come out of Worcester, MA, but there it was staring me in the face. The Wormtown Be Hoppy IPA was just a really well balanced IPA with just the right amount of citrus and bitterness. Smuttynose – Bloom. This beer blew my mind and I have to say that it was the unequivocal champion in my opinion. The description sounds like it would be absolutely terrible when it mentions brewing with edible flowers. As it turns out though, apparently brewing edible flowers tastes a lot like herbal tea and when you make that into beer you get a really light, refreshing, and somewhat floral taste. I went back and had two mini-glasses of this one because I was just so impressed. 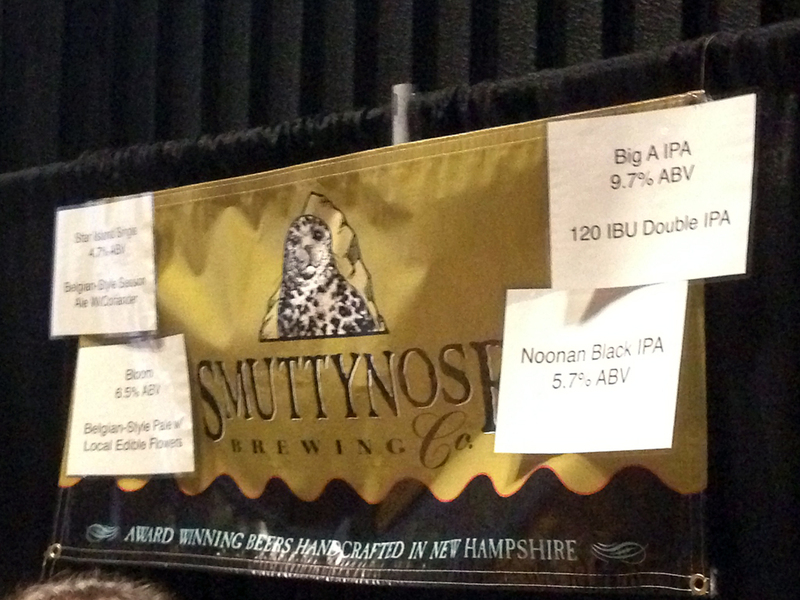 Well done, Smuttynose! All of the beers I had aren’t pictured, but you can see a gallery (below) of some of the other beers I tried along the way. Please just let me disclaim this section of the post with the comment that just because I didn’t like a beer, doesn’t mean I don’t like the brewery that makes that beer. In some cases, I only had one beer from a brewery, so I would suggest giving all of them a chance. A lot of the brewers took risks when creating beer flavors and that experimental spirit should be admired even if some of the results are unfortunate. 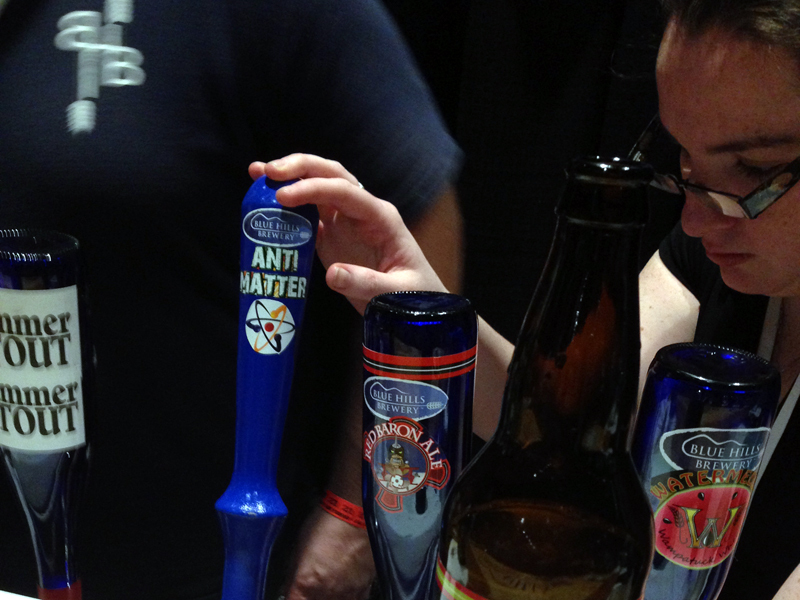 Blue Hills Brewery – Anti-Matter. This was described to me as, “the complete opposite of the Red Baron Ale,” which is one of Blue Hills Brewery’s better beers. That description fit the bill pretty well for the Anti-Matter because as the opposite of a decent beer, this was pretty terrible. This self-proclaimed “English Mild Ale” wasn’t really that mild, nor did it really fit in with the hops and IPA theme of the evening because of its maltiness. I’m all for supporting local breweries like Blue Hills in Canton, MA, so please don’t write them off, but I can’t really support this one beer. Urban Farm Fermentory – Hopped Cidah Fuggles. The brewery name is perfect for duping presumptuous, hipster Bostonians into drinking it, but the Hopped Cidah Fuggles was really just fugly… in your mouth. No amount of New England word play on “Cider” could make this sour apple beer palatable. It tasted like… well… I’ll let them describe it for you, “Spontaneously fermented fresh-pressed Maine apples fermented until they’re bone dry sour apples that happened to be fermented.” What? Exactly. 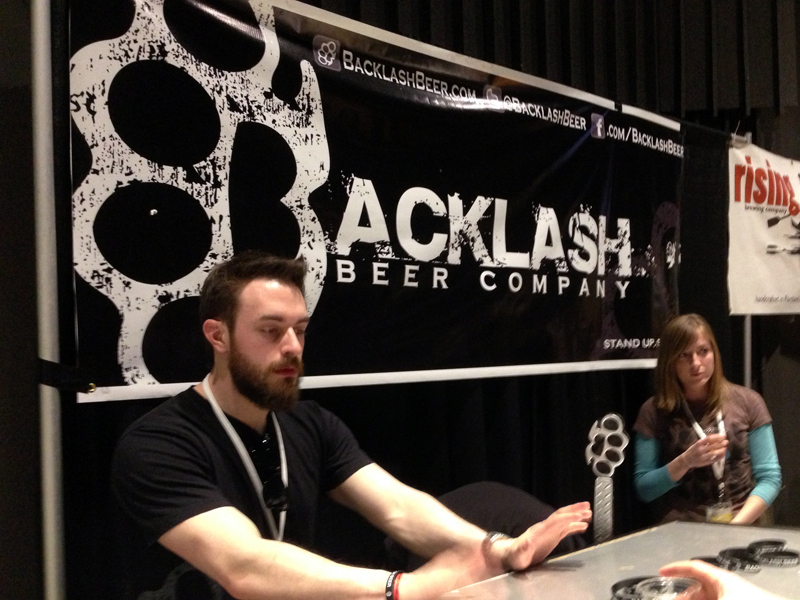 Backlash – VIP Cask Conditioned Declaration IPA. Aside from having a really long beer name, the Brewery itself is aptly named. The VIP Cask Conditioned Declaration IPA tastes like almost nothing up front, but then the bitter yet fruity citrus after taste hits you on the back of the tongue and thus, the name Backlash actually makes sense… in a bad way. All I can say is that I couldn’t move on to the next beer fast enough to get the after taste of this one out of my mouth. 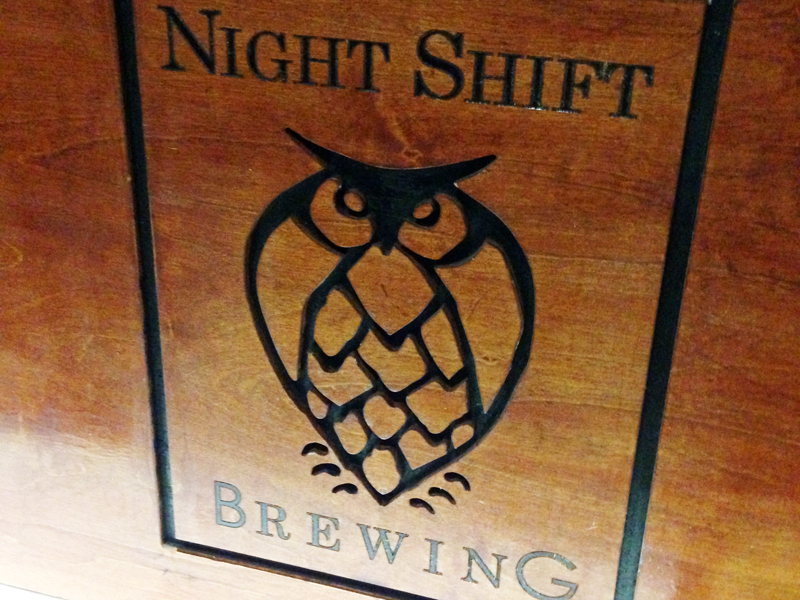 Night Shift – Ever Weisse. Worst of the worst. A “sour” beer aged from strawberries, kiwis, and dried hibiscus flowers. This tasted like sour Jolly Ranchers mixed with vinegar. No one I was with could even get a 2 oz. glass down. One or two sips was all they could muster before just dumping it out in one of the many tableside buckets or just simply abandoning their cup and finding a new one. Remember how I said that I respect beers that taste exactly how they are described? Well, I think I’ll make an exception with this one because some flavors aren’t meant to be beer. Q’s Nuts. At some point half way through the night, the hoppy beer flavors started to get a little overwhelming and my friend Double Down suggested that we find a snack. 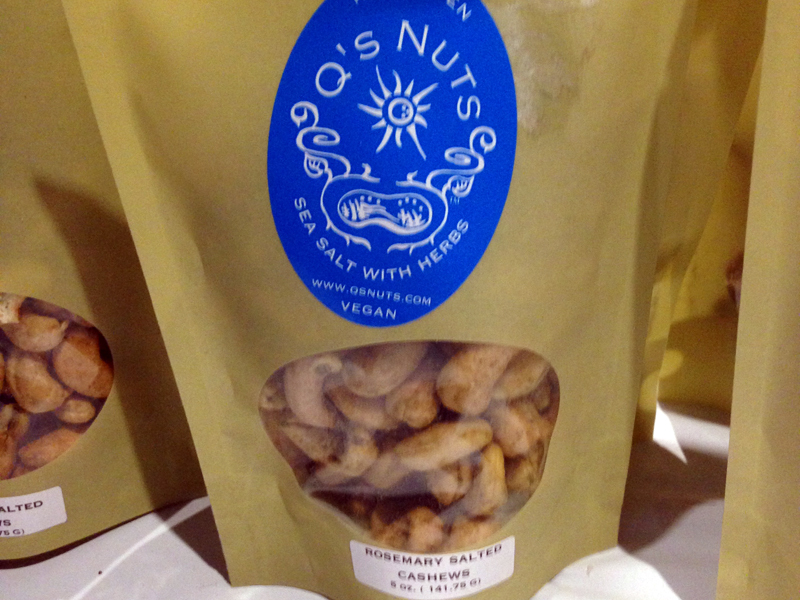 Luckily for us, Q’s Nuts had a booth sporting flavored cashews. We bought a bag of Rosemary flavored cashews and a bag of Mexican Chocolate flavored cashews. Both of them were really very good, but I was especially impressed with the Mexican Chocolate flavor because the sweetness of the cashews really went well with the spicy chocolate dusting. These nuts broke up the evening just enough to allow us to keep plowing through the rest of the beers. Roxy’s Grilled Cheese Food Truck. 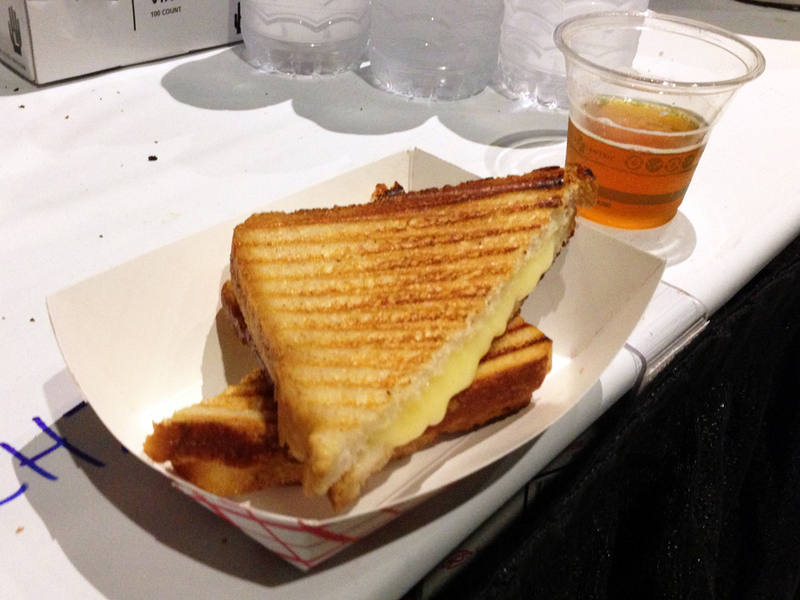 By the end of the night, we were extremely full of beer, but we needed a snack, so Double Down and I made our way over to the Roxy’s Grilled Cheese booth and ordered a basic grilled cheese sandwich. The sandwich was pretty good, but Double Down assured me that the sandwiches are better right from the food truck when cooked on a griddle rather than pressed at the booth with a sandwich press. The hearty bread was really crunchy with melted cheddar cheese and fresh avocado inside. I’d like to try a sandwich from the truck, but even pressed like this it got the job done. Personally, I enjoy somewhat more mild cheeses for grilled cheese, so while the cheddar was good, it wouldn’t be my first choice for grilled cheese. Nonetheless, Roxy’s makes all of their food fresh to order and their menu changes along with the kinds of cheeses they offer. One last comment I wanted to make about this company is that they were offering free lunch to any Emergency First Responder that came to their truck the day after the Boston Marathon bombing. I just thought that it was great that in addition to making a fine product, they also care about the community they serve as well. Please check them out if you see their truck out and about. I want a Wormtown IPA right now! It was all New England breweries? Yeah. All of the breweries there were pretty much from New England. 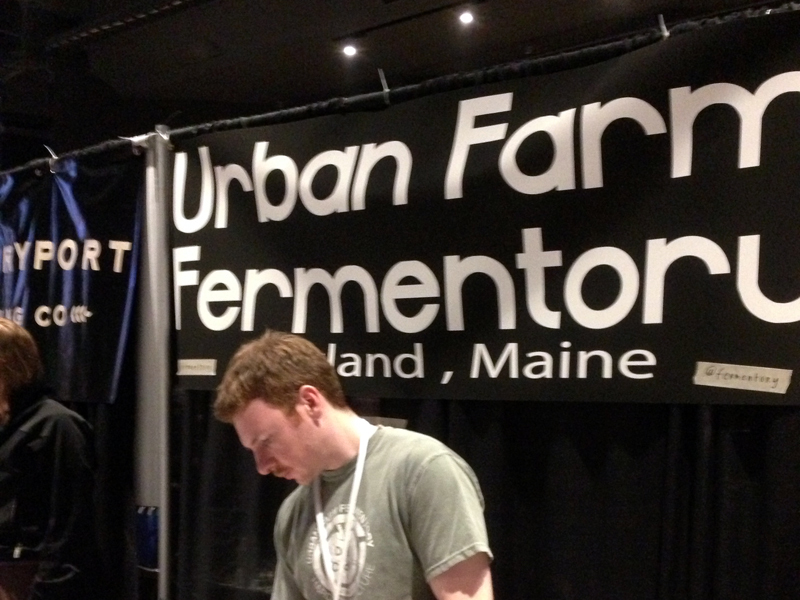 It was cool to see so many breweries I didn’t even really know about. 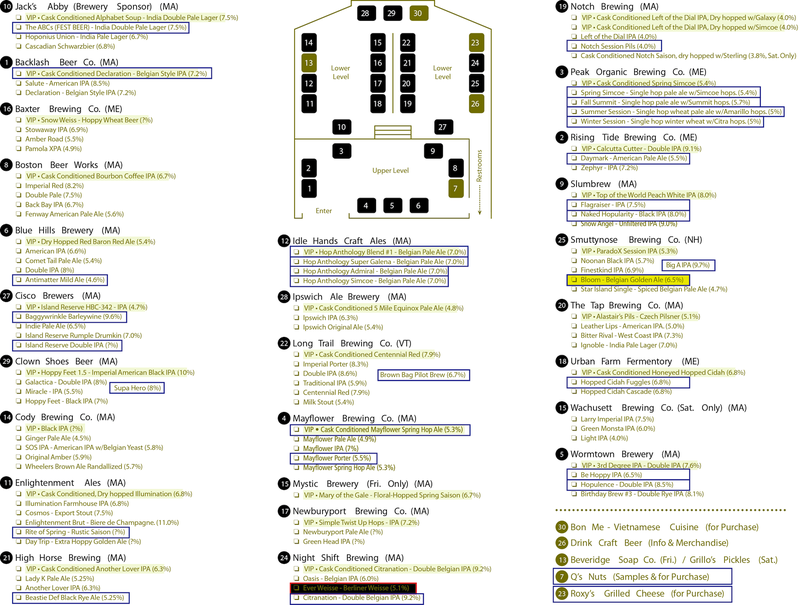 The list in the post above has all of the breweries that were there and where they are from. None were from RI. Ah. Wasn’t sure if that chart was exhaustive. Great review. I work with one of the founders of Drink Craft Beer — he’ll be happy to know you had such a good time. None of the breweries were from RI, because RI breweries are terrible. A friend of mine is opening a brewery in RI. Hopefully they can change that. I believe the name will be Bucket Brewery.